James David Van Der Beek (born March 8, 1977) is an American actor. He rose to fame beginning in 1998 for his portrayal of Dawson Leery in the WB series Dawson's Creek. He played a fictionalized version of himself on the short-lived ABC sitcom Don't Trust the B---- in Apartment 23, and, most recently, starred in CSI: Cyber as FBI Special Agent Elijah Mundo. His film roles include Varsity Blues (1999) and The Rules of Attraction (2002). Van Der Beek was born in Cheshire, Connecticut, the son of Melinda (née Weber), a former dancer and gymnastics teacher, and James William Van Der Beek, a cellular phone company executive and former professional baseball pitcher. Aged 17, while still in high school, he performed in the musical Shenandoah at the Goodspeed Opera House, and made his feature film debut in a bit role as a bully in Angus (1995) and shot a small role in the independent film I Love You, I Love You Not (1996). In early 1997, Van Der Beek auditioned for three television pilots. One of them was for the fledgling WB Network show Dawson's Creek. Van Der Beek won the title role of Dawson Leery, and the show's 1998 debut was a success that helped to establish the network and its cast. The series ran for six seasons and was syndicated worldwide. In 1999, he starred in the teen football drama Varsity Blues, which held the number 1 spot at the U.S. box office for its first two weeks. He won an MTV Movie Award for his role. Around this time he was selected one of People magazine's "50 Most Beautiful People in the World", and he appeared in several other films, including Texas Rangers, Scary Movie, and Jay & Silent Bob Strike Back, playing himself playing Jay in the movie within the movie opposite Jason Biggs as Silent Bob. In 2006 he appeared on the Direct-to-DVD thriller The Plague, which was produced by Clive Barker and was panned by critics. After Dawson's Creek ended in 2003, he returned to off-Broadway, in Lanford Wilson's Rain Dance. He completed an unproduced screenplay titled Winning. Since then, he made a few appearances on television, including a role on Ugly Betty. In 2007, he guest-starred in a two-part episode of the series Criminal Minds, playing a serial killer with dissociative identity disorder called Tobias Hankel who kidnaps and drugs one of the main characters Spencer Reid. In 2008, he made a guest appearance on How I Met Your Mother, in which he played Simon, one of Robin Scherbatsky's early boyfriends, multiple times. In 2008, he began a recurring role on One Tree Hill as a film maker who was largely the satirical opposite of Dawson Leery. He appeared in an episode of the fifth season of Medium. In 2009, he portrayed real life kidnapper Anthony Steven "Tony Zappa" Wright in the Lifetime network television movie Taken In Broad Daylight. He portrayed a fictionalized version of himself on the television series, Don't Trust the B---- in Apartment 23. The show debuted to critical praise, with Van Der Beek earning particularly good notices for his comic timing and brave sendup of his own image. The show was cancelled after two seasons but remains popular on Netflix and on Logo TV which picked it up in syndication. He played the character Simon in Season 9's "Bedtime Stories" episode of How I Met Your Mother which aired in November 2013. On January 31, 2014, he appeared on The Talk. March 4, 2015, he began his role as Senior Field Agent Elijah Mundo in the newest installment on CSI: Cyber. Van Der Beek and business consultant Kimberly Brook married on August 1, 2010, in a small ceremony at the Kabbalah Center near Dizengoff Plaza in Tel Aviv, Israel. The couple have four children together. 2009 Forgotten, TheThe Forgotten Judd Shaw Episode: "Lucky John"
↑ Notice of Van Der Beek's fourth child, dailymail.co.uk; accessed May 2, 2016. ↑ "James Van Der Beek: 25 Things You Don't Know About Me". usmagazine.com. January 16, 2013. Retrieved January 16, 2013. ↑ "James Van Der Beek profile". Filmreference.com. Retrieved April 25, 2016. ↑ "They Have Followed A Star At Christmas". Pqasb.pqarchiver.com. December 23, 1999. Retrieved April 25, 2016. ↑ Richards, David (February 10, 1994). "Review/Theater; 3 Albee One-Acters About People Boxed In". The New York Times. Retrieved May 5, 2010. ↑ Canby, Vincent (February 20, 1994). "SUNDAY VIEW; A Season of Albee, Obsessions Safely Intact". The New York Times. Retrieved May 5, 2010. ↑ Chin, Mike (January 23, 2009). "Friday Factoid: James Van Der Beek". The A Cappella Blog. Retrieved April 9, 2012. ↑ "James Van Der Beek: Actor". People. May 11, 1998. Retrieved April 25, 2016. ↑ "Varsity Blues (1999)". Box Office Mojo. Retrieved April 25, 2016. ↑ "THE RULES OF ATTRACTION Review". Aintitcool.com. Retrieved April 25, 2016. ↑ "Formosa Betrayed". Formosathemovie.com. Retrieved April 25, 2016. ↑ Joyce Eng. "James Van Der Beek Scrubs In to Mercy". TVGuide.com. Retrieved April 25, 2016. ↑ "STOLEN, Starring Jon Hamm & Josh Lucas Acquired". Ifcfilms.com. Retrieved April 25, 2016. ↑ Darren Franich (February 26, 2011). "James Van Der Beek talks Ke$ha, killing unicorns, and playing himself". EW.com PopWatch. Retrieved April 25, 2016. ↑ "Review:Don't Trust the B in Apt. 23". Retrieved April 25, 2016. 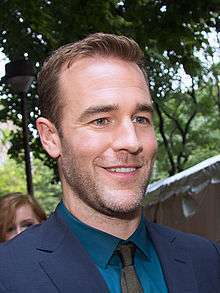 ↑ "James Van Der Beek, Wife Split – Celebrity News". UsMagazine.com. June 9, 2009. Retrieved April 25, 2016. ↑ Adam Bryant. "James Van Der Beek Files for Divorce". TVGuide.com. ↑ "Van Der Beek Divorce Settlement". News-briefs.ew.com. March 31, 2010. Retrieved April 25, 2016. ↑ "Mazal Tov: Dawson Marries". August 1, 2010. Retrieved April 25, 2016. ↑ Nudd, Tim (September 28, 2010). "James Van Der Beek Welcomes Daughter Olivia". People. Retrieved April 25, 2016. ↑ "James and Kimberly Van Der Beek Welcome a Son". People. March 13, 2012. Retrieved April 25, 2016. ↑ Lewis, Raha (January 31, 2014). "James and Kimberly Van Der Beek Name Daughter Annabel". People. Retrieved April 25, 2016. ↑ "Vandermemes from James Van Der Beek, lauren, BoTown Sound, Antonio Scarlata, Danny Jelinek, Funny Or Die, Betsy Koch, Aubrey Binzer, and Christin Trogan". Funnyordie.com. Retrieved April 25, 2016.